I'm rarely compelled to blog about a product, but here's an exception. I found this at The Pasta Shop in Berkeley just as they were building the new display. They found it at the Unfancy Food Show in Brooklyn. I was smitten by the packaging first and that's about as far as it would have gone if the nice man hadn't offered me a taste. (they make beautiful pickles too but at a higher price point). As it was, $6.99 was my gateway to a brand new addiction. The brothers McClure do indeed know what they are doing, which puts me in a pickle because now I need to figure out how to make my own version. How hard can it be? cucumbers, vinegar, water, salt, peppers (jalapenos? ), garlic, dill. I think it will take awhile before I can make such a perfect relish, but I'm going to try. And what have we adorned with this lovely little relish? Crazy sounding, but we put it on salami pizza. It works to cut the richness in the same way that pepperoncini works on a salami sandwich. What other plans do we have? Lots! Hot dogs, sausages, chicken salad and tuna salad sandwiches, bowls of pinto beans, tacos, pulled pork sandwiches. I don't know. It kind of sounds like I'm going to have to up my meat consumption temporarily or think of some vegetarian ideas. Send yours along please. 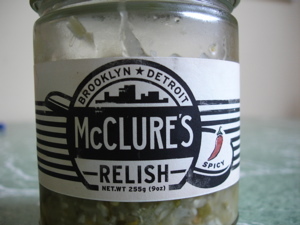 'Scuse me, I've got to go buy some Mc Clure's pickles now. This entry was posted in Books, Current Affairs, Film, breads and pizzas, breakfast, community, entertaining, from the market, pantry staples. Bookmark the permalink. Post a comment or leave a trackback: Trackback URL.